Like a reclusive child, an unhappy turtle will withdraw into its shell, physically and emotionally, and remain quietly unobtrusive for minutes or even hours. When he does finally emerge, it is often only to try to escape. An unhappy turtle is a lazy turtle. Like a reclusive child, an unhappy turtle will withdraw into its shell, physically and emotionally. He will remain quietly unobtrusive for minutes or even hours. When he does finally emerge, it is often only to try to escape. But if given ample space and naturalistic conditions, turtles and tortoises can be very active and entertaining and seem to feel quite at home. For example, provide an inch or two of smooth sand on the bottom of a shallow water aquarium, and a soft-shelled turtle will bury himself almost completely and watch in quiet anticipation for food. This may be a fish or a worm, or even a piece of prepared food. When prey approaches closely enough, the turtle's long neck will shoot out and the strong jaws will strike, procuring his tasty meal. Some are more interesting than others, but may not be suitable as pets. The fish-eating alligator snapping turtle (which occasionally attains a weight of more than 200 pounds) has a filamentous, worm-like process on the tongue. While angling, this turtle (which looks much like a brown, craggy rock) lies with his mouth widely open and spasmodically twitches the worm-like process, enticing a passing fish to swim in and take a bite. When it does so, the turtle's jaws snap shut and the fish becomes the meal. As some semiaquatic turtles grow, the outermost plates of the shell periodically peel loose and are shed. This is a very natural process. Other species do not do this. 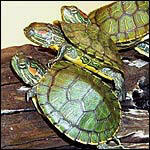 Semiaquatic turtles, of course, need a place to swim and to bask. When swimming, they look busy but synchronized and fluid in motion. They may take a few minutes out from swimming to rest quietly on the bottom of their tank or to walk slowly along searching for prey (which they find by visual, olfactory and tactile cues). When basking, the turtle clambers up his haulout, usually to a point fully above the surface of the water, then stretches his head, neck and limbs fully out. The toes are often widely spread, exposing as much webbing as possible to the heat and light. Once sufficiently warm, the turtle will slip quietly back into the water to forage once again until cool. The basking-swimming sequence may reoccur many times during the day. Despite affinities to semiaquatic turtles, box turtles are almost exclusively terrestrial and can draw both halves of their hinged plastron (bottom shell) up tightly against the bottom of the top shell (carapace). This affords a remarkably effective protection and once closed, a particularly shy individual may remain withdrawn and closed for a half hour or more. Despite carrying their homes with them, turtles and tortoises can safely negotiate rough territory. They will often climb up and over a rock or log, even when they could easily walk around the obstacle. Whether in the water or on land, food is found primarily through visual and olfactory cues. Turtles have excellent vision (just try to approach one without being seen) and apparently an acute sense of smell as well. Although chelonians may take bite-sized pieces from an oversize chunk of food, they may occasionally swallow sizable food items with little difficulty. Such things as earthworms or soft fruit may simply be raked with the foreclaws, a process that may both tear oversize chunks free and orient the food item for easier swallowing. When they are comfortably housed, it takes turtles and tortoises only a short while to associate their human caretakers with food. Within a few days your semiaquatic or aquatic turtle will probably be swimming to the front of his tank and paddling noisily in eager anticipation of being fed. Most will take food from your fingers, but use care – a turtle's beak is sharp, his jaws are strong, and, in his eagerness to eat, your finger may get bitten. Although they react more staidly, tortoises will as quickly associate you with food and plod quietly toward you to be fed. North American wood turtles often find their earthworm repast by "stomping." This technique involves raising the shell high above the ground on extended legs, then collapsing against the moist earth. The vibrations from this apparently induce earthworms to surface where they can be eaten. Turtles have sharp beak-like mandibles (some have crushing surfaces inside their mouth as well) and are capable of executing powerful bites. Indeed, some turtles are known for the strength of their jaws and the shortness of their tempers. Among these are the common and the alligator snapping turtles of America and some Australian side-necked turtles that are also referred to as snapping turtles. Other turtle species that will readily bite are the various New World mud and musk turtles, African mud turtles and many soft-shelled turtles. Tortoises are less inclined to bite and many species cannot be induced to do so. Male turtles can be aggressive toward each other, and when ready to breed, some may extend this aggression to non-receptive females. Aggression usually takes the form of nipping at another turtle's extended legs or face or at his shell, butting of shell against shell, or trying to overturn a rival. Much the same interactions are also the courtship techniques of some species. When two males are involved, these interactions will be aggression. When a male and a female are involved, it may be (at least at times) difficult to determine whether it is courtship or aggression that you are watching. In contrast, courtship by some aquatic turtles is quite graceful and intricate. A male may swim around or swim backward in front of a receptive female, fluttering and vibrating his foreclaws against her head and neck. Following this, copulation will occur. All turtles nest on land. Captives must be provided with a suitable nesting site. Females are quite exacting in finding the needed amount of ground moisture and temperature when searching for a nesting site. A very few species gather together a mound of vegetation for the nesting site. Although some turtles may dig a body pit with the forelimbs, the nest itself is dug with the hindfeet. In some cases false or satellite nests may be dug. When a nest is completed, the complement of eggs is laid and each egg is positioned with a hind foot. Once all eggs have been laid, the nest is refilled with the loosened dirt, tamped down by the female and left for the duration. Incubation may take only a month and a half or may take the better part of a year. The hatchlings usually emerge en masse to face the vagaries of what has become an increasingly hostile world.